Most of the water that is used in households or industrial enterprises becomes wastewater. To protect the nature from pollution, suspended solids, organic matter, as well as nitrogen and phosphorus must be removed from wastewater. If it is discharged untreated, the living conditions of water organisms deteriorate. Suspended solids reduce the transparency of water, and, when settled, cause silting of water bodies. Breaking down of organic substances diminishes the oxygen content of water, and the nutrients nitrogen and phosphorus promote eutrophication of waters. Fixtec Ltd offers compact, fully prefabricated (package) wastewater treatment plants BioFix and Bioclere, which are designed for purifying domestic wastewater and similar industrial wastewater. BioFix is a totally Estonian product which has been constructed and is produced by Fixtec Ltd. It is the only small wastewater treatment plant of Estonian origin, which has been tested according to European Union standards and holds a CE marking. The well-known made-in-Finland treatment plants Bioclere are in use in 35 countries all over the world. Installation of package plants is easy, fast and inexpensive. 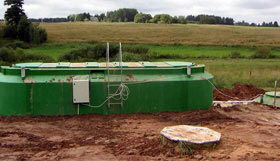 Concerning treatment technology Fixtec Ltd offers two types of wastewater treatment plants. Fixed film reactors with extended aeration Biofix, the smallest of which are meant for private and twin houses (BioFix 1: Q = 1 m3/d, 5 PE, and BioFix 2: Q = 2 m3/d, 10 PE). BioFix 3 and bigger models are suitable for larger objects (Q = 3 m3/d, 15 PE to Q = 40 m3/d, 260 PE). To this group belong also the container-type treatment plants BioFix Biocon KKB (Q = 120 m3/d, 600 PE to Q = 5000 m3/d, 17 000 PE). Trickling biofilters Bioclere for treating sewage of small settlements and for pretreatment of wastewater from small industrial enterprises (hydraulic load 2 to 105 m3/d, pollution load 10 to 415 PE).